This title contains a book & CD. It is suitable for ages 3 years & over. A new and unique concept that introduces children to languages and cultures through songs, making learning fun. This book lets you: listen to the songs; look at the pictures; discover new words; and, dance and sing in English! Developed by ABC Melody, an innovative publisher specializing in early childhood, this set entertains and enables children to sing and learn at their own pace whilst having fun, at home or in the car. 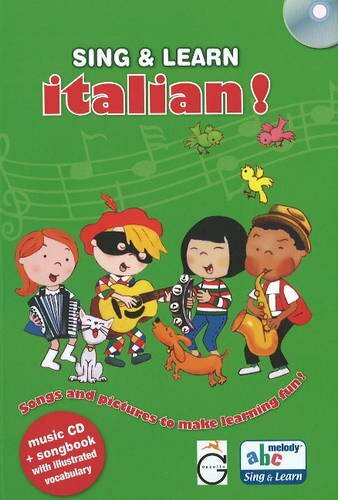 This book features such themes as: Greetings; The Alphabet; Numbers; Colors; Telling the Time; Means of Transportation; Carnivale; Food; Holiday; and, Gelato Flavours. This is a 24 page book with illustrated vocabulary. It features texts of the songs with English translations. It contains a music CD with 10 original songs (58 minute duration). It offers introduction to fun music styles: Salsa, Pop, Jazz and Reggae; Singers and children from Italy; Instrumental versions - Sing to the music and create new songs! these links do not work. someone could fix please. There is something really strange about those links. Can you, please, check them ?